The Windmill at Fulbourn stands on an outlier of the Gog Magog Hills 4 miles east of the City of Cambridge. Low chalk hills run to the south of it; northwards the Windmill overlooks the Fens which are at most only a few feet above sea level. The cap of the Windmill rises to 160 feet above sea-level and from it there is an uninterrupted view of the roofs and towers of Ely Cathedral. It has long been an outstanding landmark in the south Cambridgeshire countryside. It was the enclosure of the parish for the improvement of cultivation that led to the building of the present Windmill. Much of the land in the north of the parish was low-lying and waterlogged and needed draining to convert it into profitable arable land. Fulbourn Fen was a peat fen only 20 feet above sea level over which the Great Wilbraham River spread its waters in times of flood. The Act of Enclosure for Fulbourn was passed in 1806 and the Commissioners completed their work two years later. The drainage of the parish reduced the level of water in the upper reaches of the Great Wilbraham River on which the manorial watermill was situated. The loss of power brought to an end the life of a mill which had first been recorded in Domesday Book. In 1808 the machinery of the watermill was put up for sale. A new mill was therefore needed and the Enclosure Commissioners allotted one acre on Mill Hill, on which to build a mill and miller’s cottage, to John Chaplin, a considerable landowner and farmer. He used copies of Old Moore’s Almanack as a diary, entering personal events and business notes in the margins of the calendar. In 1808 he recorded against 11 July, ‘I laid the first brick of my mill’; 22 November, ‘Mill sails put up’; 15 December, ‘Began grinding’. It is a large octagonal smock mill with a brick base and wooden superstructure. Its outline is squat with a shallow conical cap. The fantail, as usual in Cambridgeshire mills, is close against the cap. The mill holds three stones, one of French burr and two of Derbyshire stone. With floors 24 feet in diameter, there is exceptional space for working the mill. At the height of its prosperity in the middle of the nineteenth century Fulbourn Windmill benefited from its position in the heart of East Anglia, famous for its heavy crops of wheat. Since Roman times the area has produced a surplus for export beyond its borders. The inhabitants of the area enjoyed better bread in the eighteenth century than that in any other part of the country. Nine-tenths of the flour in their loaves was wheaten, whereas in Lancashire it was barely a quarter. The Windmill began work during the Napoleonic Wars when corn prices were maintained at a high level. They were kept high by the Corn Laws which were finally repealed in 1846. Agricultural prosperity continued for a quarter century after 1846. The volume of work and the high price of corn brought profit to the owner of the Windmill, reputed to be over £400 a year. At this time the mill occupied a central place in the economy of the parish. It served the larger land-owners, the Lord of the Manor, the Rector and the Chaplins, the smaller tenant farmers, and even the poorest villagers who brought to it their gleanings from the harvest field. The last quarter of the nineteenth century was a period of deep agricultural depression. Great changes were taking place in the economy of the country. The population rose from 21 million in 1851 to 37 million in 1901. This pressure on the food supply for an increasingly urban population was met by the import of corn chiefly from America free of duty. It competed with homegrown wheat and lowered its price to the disadvantage of English farmers. The hard spring wheat from America was also found to make a better loaf. Wind and water power were also challenged by the application of the more reliable power of steam to milling. Large steam mills were sited at ports like Liverpool which received the imported wheat, and spread throughout the country. By 1863 a steam mill existed at Fulbourn Station. Windmills thus became marginal to the economy of the country and the skilled millwrights who had served the old mills moved to factories in the towns or emigrated overseas. 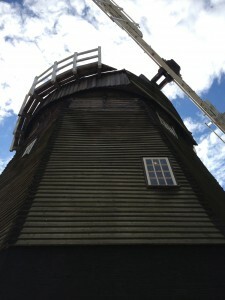 In the last stages of its working life Fulbourn Windmill was reduced to the grinding of animal feedstuffs for the smaller farmers of the village. Between 1931 and 1933 only 22 tons of grain were milled, consisting of 91 per cent of barley, oats, beans, maize and peas. Only nine per cent consisted of wheat. The major period of the mill’s activity was from the autumn to the spring; no grinding was recorded from May to July in 1931, and from May to October in 1932. E. G. Reed’s customers were then smallholders or tenant farmers with 50 or fewer acres. Reed charged ls. 2d for grinding a coomb of grain, a variable measure ranging from 19 stone of beans to 12 stone of oats, and his takings were low. The best months of 1931 to 1933 yielded an average of £3 8s. 9d; the worst 10s. 10d; and the summer months nothing. Reed was driven to supplement his income by pig-keeping, poultry and his sons’ harvest work. Among the small amounts of wheat ground at the Windmill were the gleanings of the poorer villagers after the last load had been carried from the harvest field. The pattern of gleaning was strictly controlled. The church bell was rung at 8a.m. to mark the beginning of the day’s gleaning and at 5p.m. to mark its end. The women tied sacks to their waist to hold their gleanings and as the sack filled they emptied them on to an old sheet. The sheets were tied into bundles and taken on their heads to a threshing barn. The women threshed the corn with flails, cleaned it in a dressing gig, and weighed it. They climbed the hill to the Windmill with their corn and often paid the miller with a proportion of their flour. Mrs George Hancock, born about 1870, once gleaned eleven bushels of wheat. This would produce at least two four-pound loaves a week for her family until the next harvest. In the summer of 1933 the windmill was struck by lightning twice in one thunderstorm and ‘split from top to bottom on one side.’ C. J. Mapey has spent considerable sums of money on its maintenance since 1920 and repaired the damage only to be faced three years later with another storm in which the fan blew off. Some grinding took place in 1936 and 1937 using the auxiliary power of a tractor to drive an external pulley on the northwest wall of the roundhouse connected to the northern runner stone. The shutters were removed from the sails in 1937. Fulbourn Windmill had ended its useful life. Ten years later the driving machinery, the stones, two which retained their horses and hoppers, and the sack hoist were still intact, The dressing machinery and chaff cutter once in the mill seem to have disappeared. In 1937 the mill body, cap and sails were painted white but during the war the mill was tarred all over. In May 1952 the sails were again damaged by lightning. The Windmill was left to decay for the next quarter of a century. The binders and floors became so rotten that by 1974 the Windmill was in imminent danger of collapse.